There is no age limit for love of nature and adventure, especially for 77-year-old Hacı Ramazan Akbaş, who lives in Hakkari and has been climbing the highest peaks in the region for years. 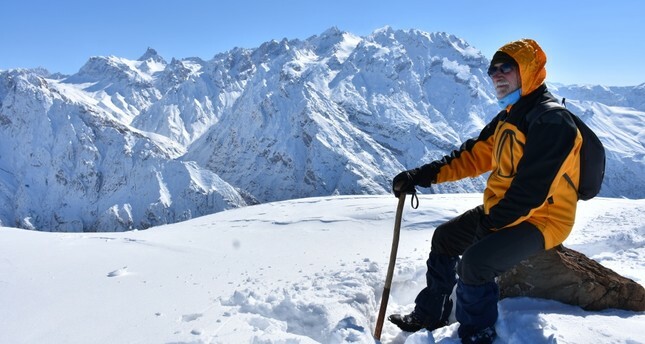 A father of nine and grandfather of 16, Akbaş accompanies tourists who journey to mountain summits, including Sümbül, Reşko, Sat, Karadağ, Süphan and Artos. You might think that someone as old as Akbaş should give himself a rest, but he says he is as healthy as ever thanks to all the climbs and walks he has been taking for the last 50 years. "These mountain climbs keeps me young," says Akbaş. "Thanks to these activities I lead a life free from diseases. For those who want to have a healthy life, a balanced diet and an exercise routine is a must." Akbaş says he has never suffered from a major illness. He says that he keeps track of what he eats and drinks every day and has an exercise program he keeps up on a daily basis. "I leave my house at 7 a.m. in the morning every day and walk in the mountains, and then return around 9 p.m. at night. Sometimes, when I join tracking groups, we set up camp as well. I urge all young people to come to the mountains. They can come and feel the joy of nature and exercise as well," Akbaş says. Although he is almost 80 years old, Akbaş does not have any intention of stopping his daily climbs up the mountains anytime soon. "God willing, I hope to continue what I do for another 10 years. I wish young people were not stuck indoors and instead come and join us. I might be old, but I am here, standing strong," Akbaş added.